Digital competence is the set of knowledge, skills and attitudes to enable the confident, creative and critical use of technologies and systems. It is essential for children and young people, if they are to be informed, capable and have the potential to be successful in today’s society. The Digital Competence Framework (DCF) has been designed to encapsulate the skills that will help learners thrive in an increasingly digital world. It will improve digital competence by helping embed digital skills across the curriculum. They will be required to apply digital skills to a wide range of scenarios that can be transferred to the world of work. 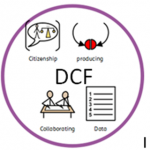 The DCF has been developed by practitioners from Digital Pioneer Schools, drawing on research, including consideration of existing regional and international digital frameworks. It has been designed to be a useful tool for schools and other settings to develop learners’ digital skills and to facilitate and strengthen learning across the curriculum. · The Pioneer Network will continue to work together to develop the new curriculum and keep stakeholders engaged in the process and appraised of progress. · The DCF and Professional Learning Offer will continue to be refined taking account of feedback from practitioners and various programmes of work. · Schools/settings will have made good progress in using the DCF in their schools/settings. · The ambition is for the new curriculum to be available to settings and schools from September 2018 and used to support learning and teaching from September 2021. · The Pioneer Network, working with regional consortia, will refine and test the Professional Learning Offer which will enable schools/settings to use the DCF across the new curriculum by 2021.